Is it snowing in Espot Esquí ?¡Gracias! With a respectable 930m vertical drop, Espot Esquí is a quiet resort whose domain is surrounded by a National Park -Parc Nacional d´Aigüestortes-. Despite being considered a familiar resort, Espot Esquí also offers great piste and off-piste possibilities for expert skiers. 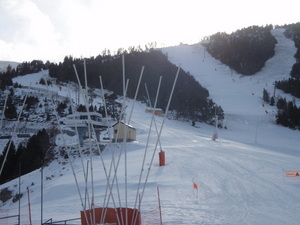 Venue for international competitions, Espot Esquí is increasing in popularity among advanced skiers across the Pyrenees. Espot Esquí, previously known as Super Espot, is in Spain. It is a small ski resort with 7 ski lifts (2 chair lift, 5 surface lifts) and an impressive 930 metres (3050 feet) of vertical descent. 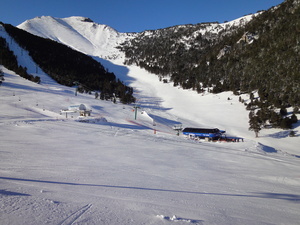 Espot Esquí has 22 pistes and snow making facilities over 10.6 kms of the terrain. Perfect station to spend a day with the whole family. Two detachable chairlifts serve the slopes, all of them groomed by 3 snow-grooming machines. The station has a really friendly and comfortable round restaurant on 2000 metres. 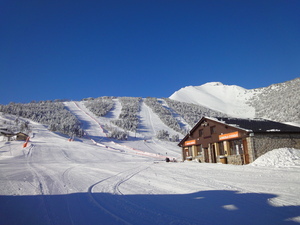 Good blue level slopes and two magnificent red slopes: "La Pala d'Eixe" and "La Rampa". 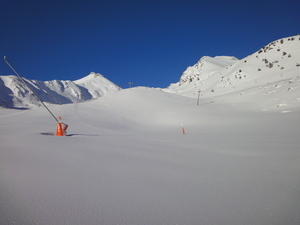 Nice black slopes and freeride areas.